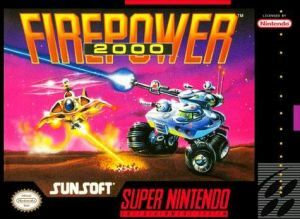 Firepower 2000 for Super Nintendo allows you to battle the forces of evil and their weapons or else the world is doomed. Driving a souped-up, heavily armored jeep, or a helicopter stocked with missiles, you're going to war alone. You'll be able to find and equip yourself with a variety of weapons including flame-throwers, plasma cannons, lasers, guided missiles, and nuclear arms.